BlackBerry maker Research in Motion has released an update to their Messenger service today through BlackBerry App World. This new update, dubbed BlackBerry Messenger 6, enables the popular program to interact with other applications which introduces a whole new level of social networking to Messenger. The update works in conjunction with a handful of new connected apps including FourSquare and Wikitude, allowing users to chat or post updates within a supported application. 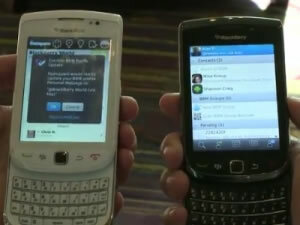 Furthermore you can see which apps your friends are using and even download those apps from their BBM profile. Your BBM profile can be updated automatically to display high scores achieved in various games or show off recently earned FourSquare badges. To use these new features, you will need to first install BBM6 and your device must be running OS 4.5 or above. A complete list of BBM6-enabled apps can be found at the official BlackBerry blog. BBM6 is very similar to iMessage, a new messaging application that Apple plans to include in the upcoming iOS 5. iMessage will work over 3G and Wi-Fi and will serve as an alternative to traditional text messaging. Besides the typical SMS/MMS functionality, iMessage will offer delivery receipts, read receipts and user typing indications. It remains to be seen if this is "too little, too late" for RIM, who announced earlier this week that 2,000 jobs were being cut worldwide.